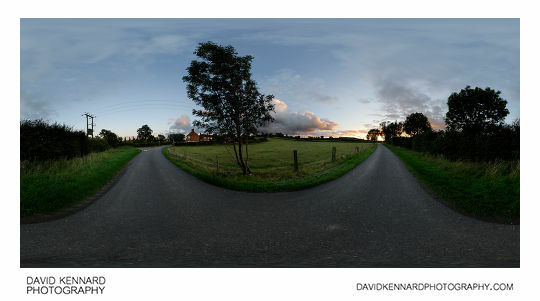 I went out on an evening walk a few days ago, mainly to try and take a 360° panorama of a farm building. I had taken a panorama by this specific building a few weeks ago, but the images had turned out to be too dark to be worth processing (even though they looked okay on the camera LCD at the time). So I wanted to try and take the same image again, except with a better exposure, and the light would also be slightly different. 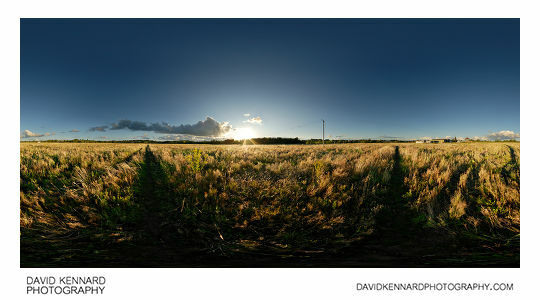 One problem I had with all these panoramas is that it was quite windy at the time I took them. 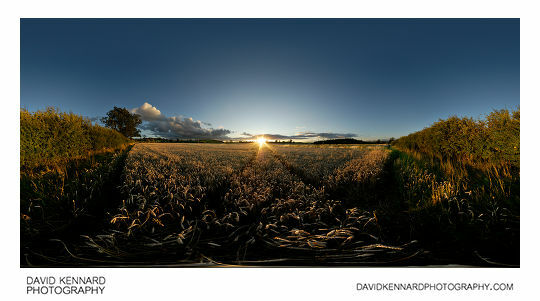 This meant blending the exposures together was difficult due to trees, bushes etc. moving between the exposures. (All the panos here, and the large majority of all my non-macro photos are bracketed exposures blended together to increase the dynamic range) . 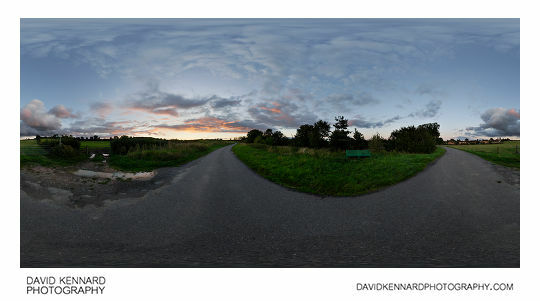 For the above panorama and next one I took a bit further along the road (below), it was getting too dark to do a handheld nadir shot. So for these ones I used the 'offset nadir' technique. This just involves taking additional nadir shots with the tripod moved a bit in one direction, and then a bit in the opposite direction. 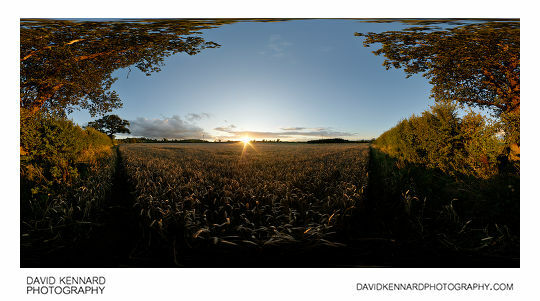 Then I use the viewpoint correction feature in PTGUI on these images when stitching. It is difficult to make sure you move the tripod the required amount to completely cover the nadir though, and I found in one of these images I also had to use a bit of content-aware fill in Photoshop. (The clone or patch tool would probably have also worked just as well). 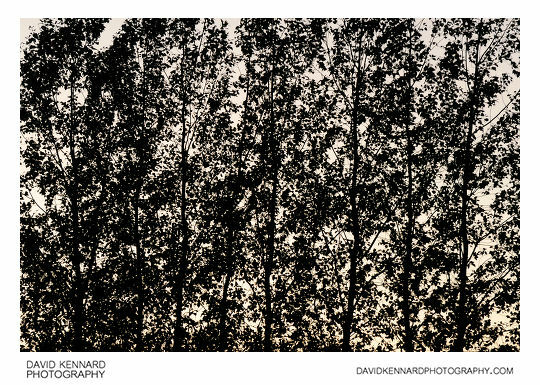 And a bit further on I noticed this row of trees that made nice silhouettes. 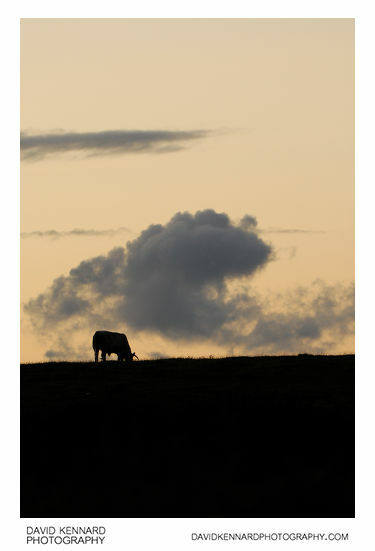 I think maybe I should get myself a sound recorder, as this photo is missing the sound of the bulls chewing in the nearby field. 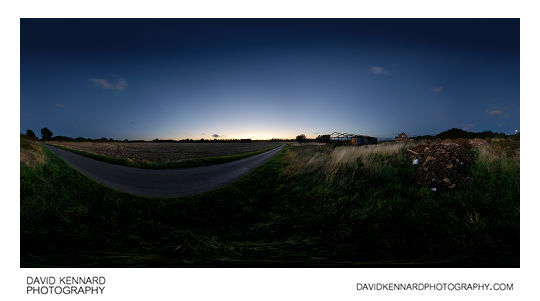 When I got to the area of the road round about where Lubenham road changes into Farndon road (and there is a newly built house nearby), I decided to take another pano. I did also manage to get a shot with the headlights of a car streaking past, but I decided in the end that I liked the image better without the light streak. As I carried on along the road, I was surprised to see a load of cyclists cycling past me. They didn't look like super-keen cyclists either, so I'm not sure what they were all doing riding in a large group in the dark. I walked back home, towards Market Harborough, along the old railway line that runs from Harborough to Lubenham. Unfortunately it had rained quite a bit lately, and with it being dark I couldn't see where the puddles were too well, so I stepped in quite a few puddles on the way back home. 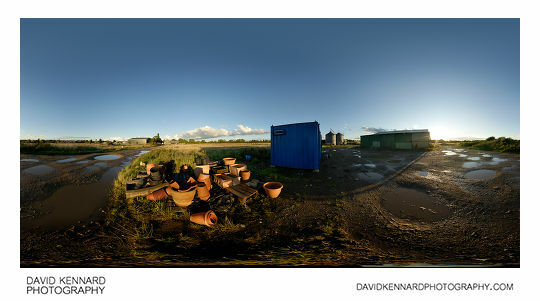 I did think of taking a panorama of the wet old railway line, but decided that it would be better done during the daytime where you might be able to get nice reflections of blue sky and fluffy white clouds in the puddles. Of course, whether it's still really wet down there on a day that has weather like that, and whether I can justify going back there at that time, is another thing completely.